Lookit! 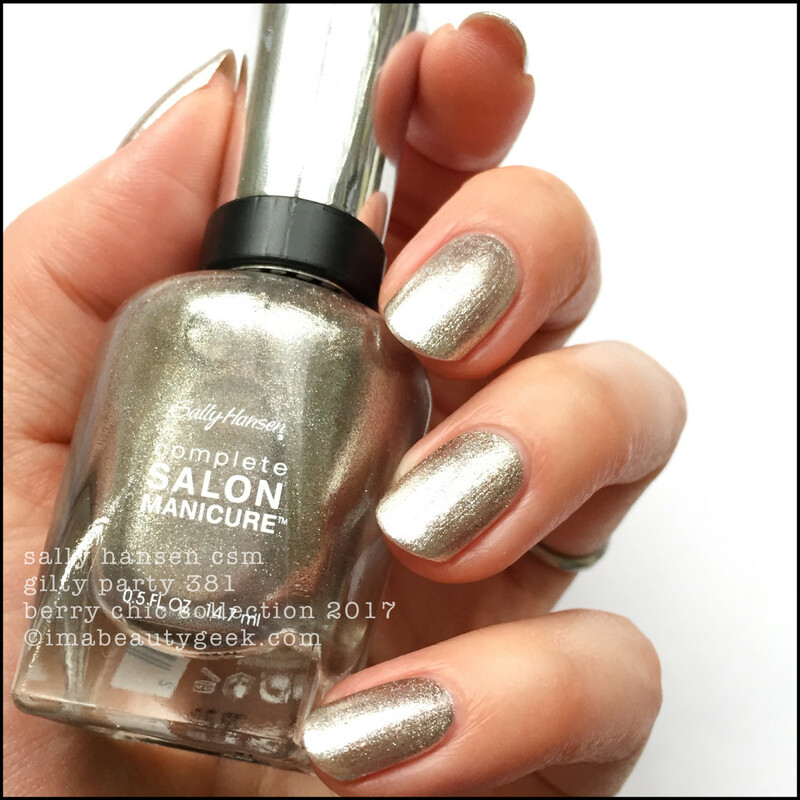 Sally Hansen has a “new" collection of six Complete Salon Manicure shades for Holiday 2017! The collection is called Berry Chic and we should look at it because it’s a warm and cozy bunch of shades. Sally Hansen Gilty Party 381 (above). 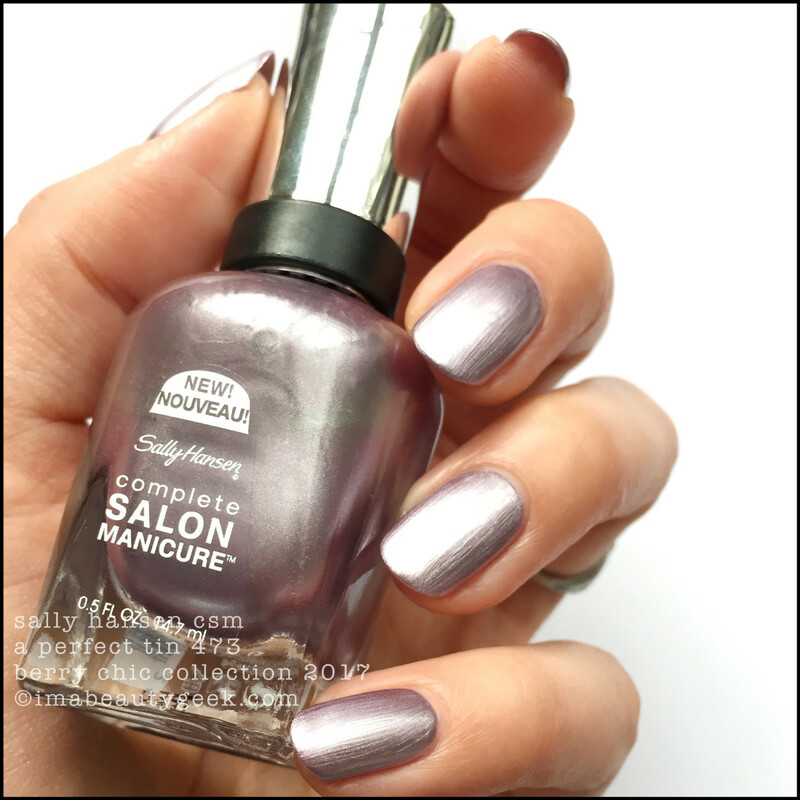 Really good for holiday, this thing is bright, shimmery, and perfect in 2 quick coats. The CSM shades have base and top built right in so in 2 coats, you’re done! Sally Hansen A Perfect Tin 473 (above). My notes tell me this is 2 coats. They also say that without a super-smooth base, you’re not ever going to love this. It’s a frosty-chromey sort of thing and them streaks don’t dry down all the way. I like it like this though – for some reason it appeals to me. I’ve seen it before though and we’ll talk about that a little later on, k? 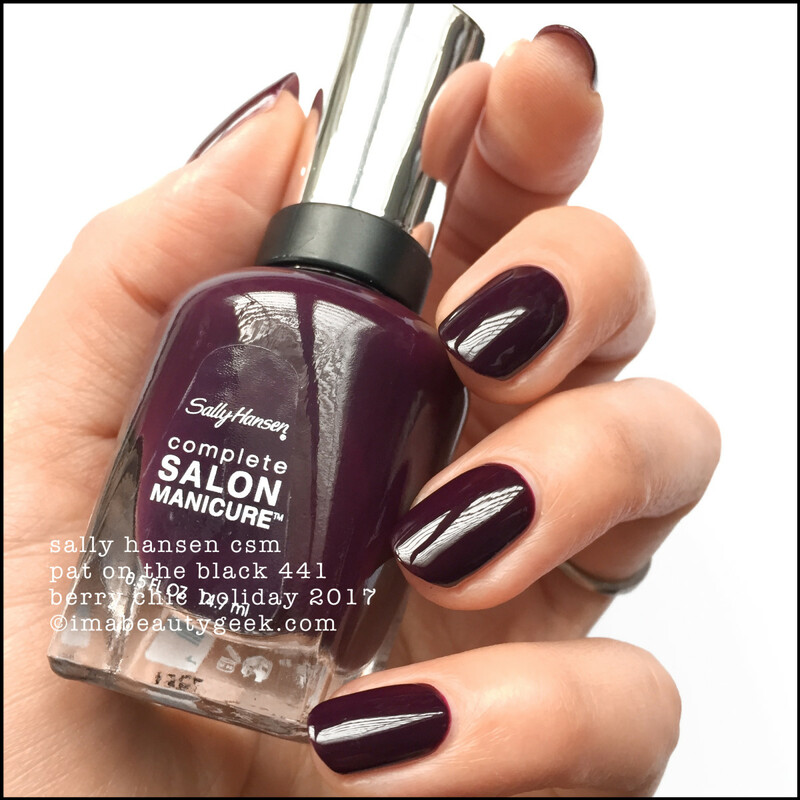 Sally Hansen Lucky Dress 018 (above). 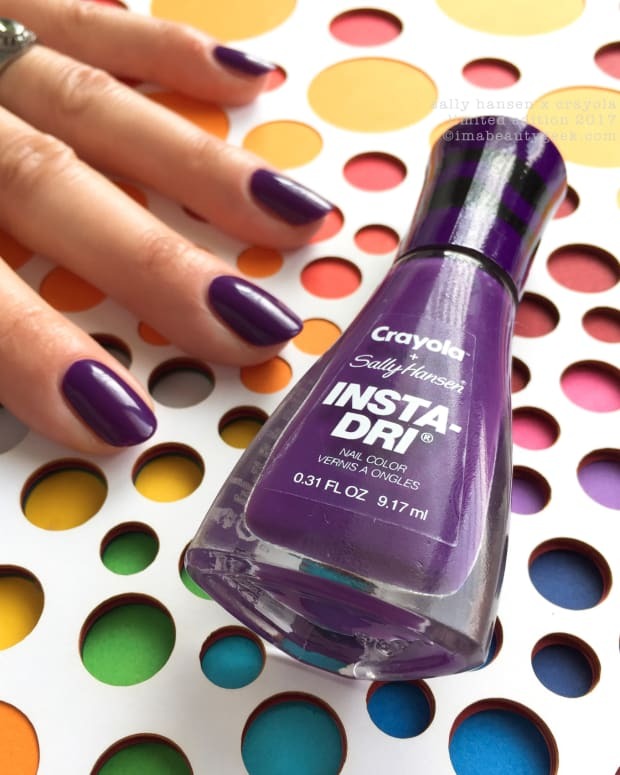 Here’s a shade that screams all kinds of winter! She’s an über-blackened eggplant and that’s 2 coats. I find many of these CSM brushes are a bit lopsided at the edges so my cuticle lines never come out as perfectly rounded as I like but it’s close, right? Oh! If you’re going to get this one and paint it, let the first coat set before you do the second – if you don’t, you’ll pull up your first coat and end up with patches. Nobody needs to see patches in their Lucky Dress. 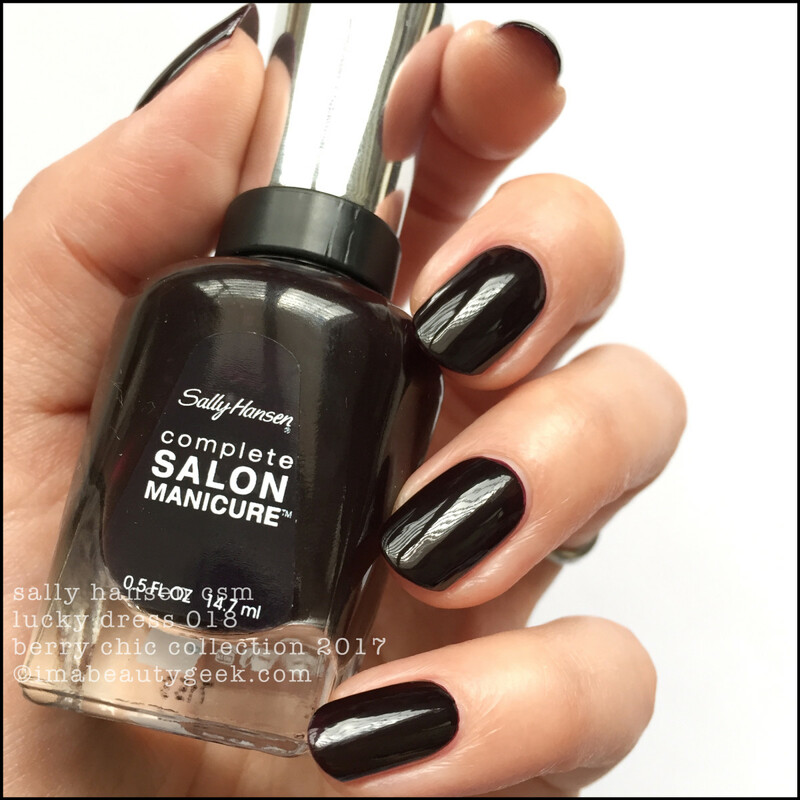 Sally Hansen Pat on the Black 441 (above). Huh. With a name like that, you’d kind of expect this to be a little closer to black-actual wouldn’t you? Not that it matters, because really this shade is quite lovely. It took me 3 coats but if you do your coats thicker than I do, you can probably get ‘er done in 2. Lookit how shiny! Sally Hansen Ruby Do 421 (above). Once again, the brush here was a bit uneven and felt a bit stiff so I trimmed it with my little scissors. I still had to do 3 coats to crush the patchy, but the fact I don’t need top coat means I end up skipping a step, so there’s that, right? 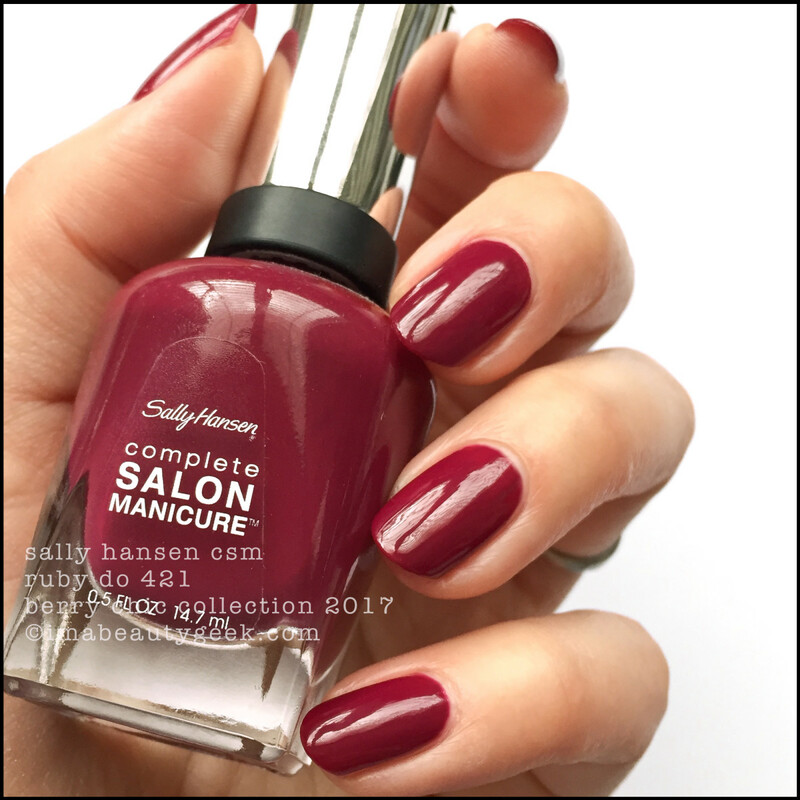 Sally Hansen Wine Not 411 (above). I have no notes for this so that usually means sumthin’ went on in 2 quick and easy coats. I think I must have been so thrilled with the shimmery holiday redness of this shade that I just plain forgot! Either that, or I was busy experiencing that feeling of déjà-vu. Oh yes. I’ve been here before. In fact, I’ve been in ALL of these shades before. Every single one of these shades is a re-promote. I have things I could say about companies putting out “new" collections of they-already-exist shades, but I’m not going to say a word. All I’m going to do is suggest that if any of these shades gave you the #GrabbyHands, you check your Archives before you buy yourself a second bottle. 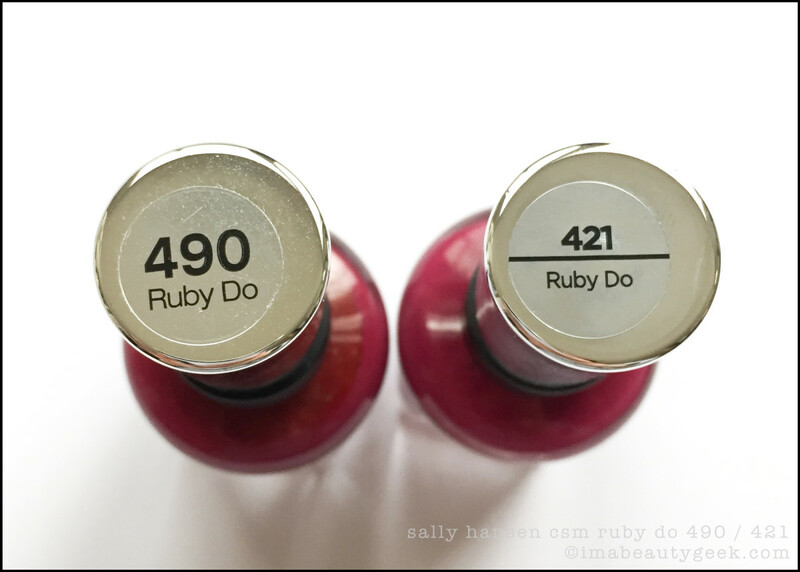 The numbers may have changed, and it’s possible the formulas have as well, but I’ll tell ya what, the shade names are the same and the colours in the bottles are all very, very close to the originals that have been in my Archives for quite some time. Harumph. But let’s not leave on that note, k? Let’s leave on this one! 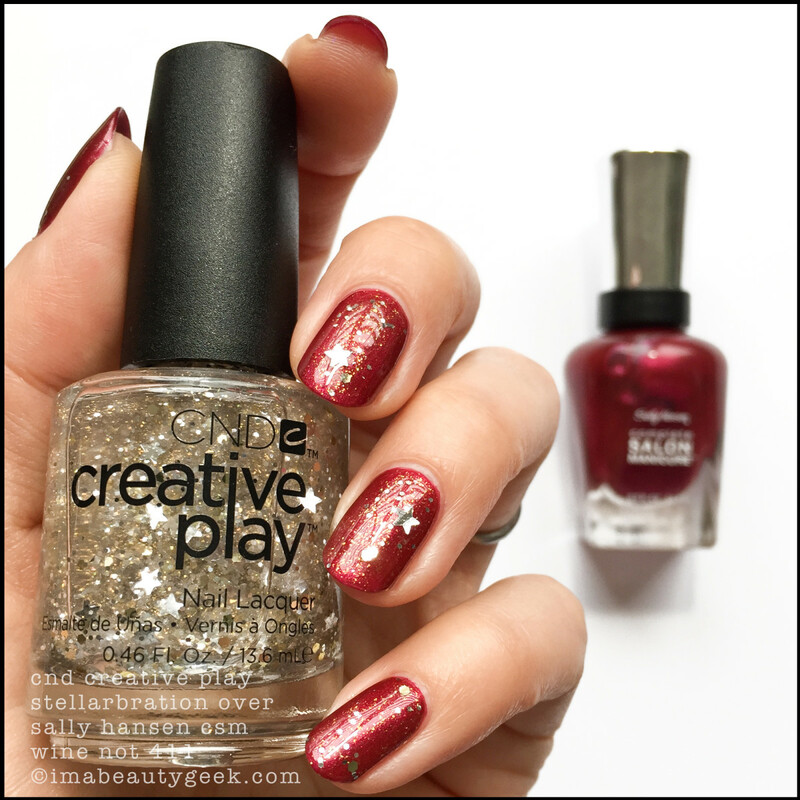 CND Creative Play Stellarbration over Sally Hansen CSM Wine Not 411 (above). That’s 1 coat of mah stars over 2 coats of my Wine Not. I know! So much the holiday! !